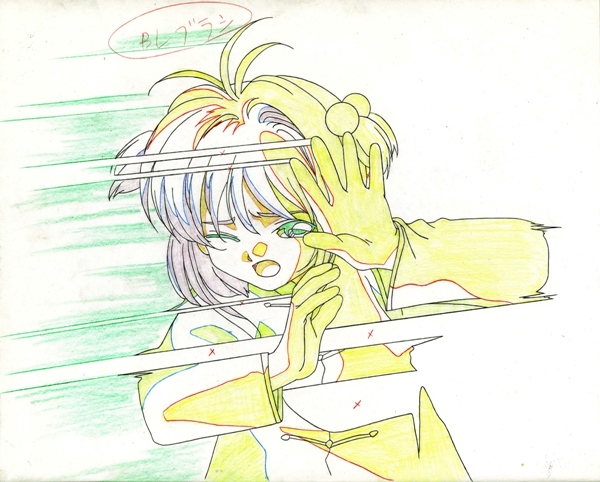 Updated 3/3/2016 When Kero-chan “releases” the key for the first time, Sakura is at first stunned and blinded by the burst of energy. Sequence number: A2 END plus an unnumbered layer with airbrushing. This cel is unusual in several ways. 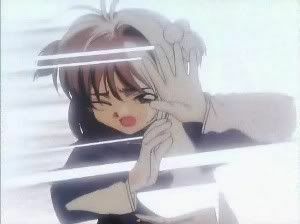 Notice how several strips through Sakura's body have been left unpainted, while other parts of her body have been painted a glaring white. This is because the cel was designed to be filmed on a light table against a brilliant backlight, which partially washed out the detail around the unpainted strips and made the white portions in fact appear bluish gray in the final broadcast version. See the screen cap below, which (like the cel) is courtesy of kacfrog711, curator of "The Right to Bleed," who was generous enough to take an offer on this beautiful item.